Durham, NC, April 15, 2019 --(PR.com)-- Businesses increasingly make use of a variety of cloud options to host their applications. For these companies, servers that can achieve strong performance when running multiple applications simultaneously represent a wise investment. PT conducted hands-on testing of servers powered by Intel Xeon Platinum 8160 processors and servers powered by AMD EPYC 7601 processors. 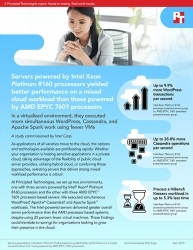 While executing simultaneous WordPress, Apache Cassandra, and Apache Spark workloads, the Intel Xeon Platinum 8160 processor-powered servers delivered greater overall server performance than the AMD EPYC 7601 processor-based systems, despite using fewer virtual machines. To learn more, read the report at http://facts.pt/bwnqd4l.